This luscious chocolate filled basket is perfect for chocolate lovers everywhere. Whether theyre at home or the office. 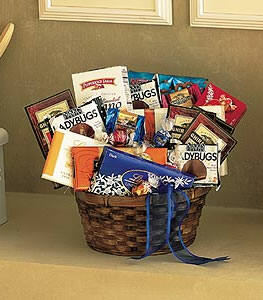 Chocolate bars, candies and cookies arrive in a wicker basket tied with a blue ribbon. Photo is representational only; basket items may vary.Note: Same day delivery for this item may not be available in all areas. Thank you. My Mom said the flowers looked great!